Falun Gong practitioners’ “Chinese Pegasus” float was an instant hit at the Sydney Chinese New Year Twilight Parade on February 2, 2014. The float, designed and created by local practitioners, is quite fitting for the Year of the Horse. 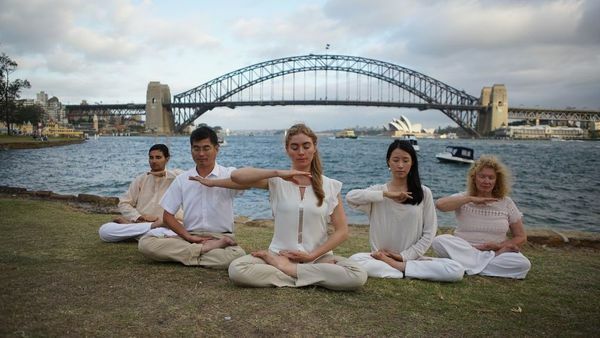 It displays the beauty of Truth-Compassion-Tolerance, along with traditional Chinese concepts of harmony between heaven and earth, says John Deller, the coordinator of the Falun Gong entry for this parade. Guangzhou City in Guangdong Province is one of the most economically developed mega-cities in China. It is also the centre of China’s organ transplant industry. Guangzhou is one of the cities in which the persecution of Falun Gong is the most severe. Various government organizations are suspected of implementing the organ harvesting of live Falun Gong practitioners on a massive industrial scale. This report provides leads to be pursued in uncovering hard evidence of these crimes, to help judicial bodies around the world bring the guilty parties to justice. On 17 December 2009, in a landmark decision, an Argentine judge indicted and ordered the local Interpol department to seek the arrest of two high-ranking Chinese Communist Party (CCP) officials for their role in crimes against humanity committed against Falun Gong practitioners. The ruling follows a similar decision in Spain last month, when the Spanish National Court indicted five top CCP leaders for their involvement in genocide and torture against Falun Gong. In a groundbreaking case, following a two-year investigation, a Spanish judge has accepted charges of genocide and torture in a case filed against five high-ranking CCP officials for their role in the persecution of Falun Gong. This historic decision by a Spanish judge means that Chinese Communist Party leaders responsible for brutal crimes are now one step closer to being brought to justice,” said Carlos Iglesias, a local lawyer representing the plaintiffs. with its 2008 pre-Olympics efforts to ferret out and punish Falun Gong practitioners. Authorities conducted propaganda campaigns that deride Falun Gong, carried out strict surveillance of practitioners, detained and imprisoned large numbers of practitioners, and subjected some who refuse to disavow Falun Gong to torture and other abuses in reeducation through labor facilities. On July 20, 1999, the then leader of the Chinese Communist Party (CCP), Jiang Zemin, banned the Falun Gong spiritual practice. At the beginning of the suppression, Jiang intended to eradicate Falun Gong in “three months.” Intelligence agents locked onto Falun Gong practitioners whom they thought to be “leaders,” and its propaganda machinery prepared potent fabrications to vilify Falun Gong and turn the public against it. In so many previous persecutions, these two steps alone were enough to break the backbone and spirit of any victim group.